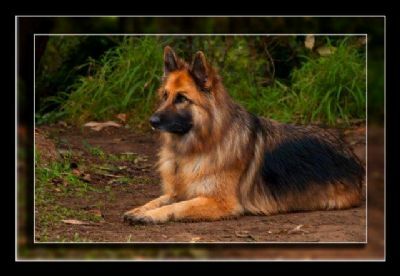 The German Shepherd Dog breed now has two varieties. Long coats are now officially accepted as a second variety. The SV amended the rules in 2011 and the ANKC subsequently added long coats as an accepted variety of the breed in 2012. Photo left is a typical example of one of our long coats. 'Suese' is a magnificient long coat and she is owned by Gavin King who is naturally very proud of her. She has a temperament to match her good looks. If you would like a long coat check out our 'Puppies for sale' page.